Sir David Paradine Frost, OBE (April 7, 1939 – August 31, 2013) was an English journalist, comedian, writer, media personality, and television host. After graduating from Cambridge University, Frost rose to prominence in the UK when he was chosen to host the satirical program That Was the Week That Was in 1962. His performance on this show led to half a century of success on television. Frost was one of the "Famous Five" who were behind the launch of ITV breakfast station TV-am in 1983. For the BBC, he hosted the Sunday morning interview program Breakfast with Frost from 1993 to 2005. He spent two decades as host of Through the Keyhole. From 2006 to 2012 he hosted the weekly program Frost Over the World on Al Jazeera English and from 2012, the weekly program The Frost Interview. Frost was well known for his television interviews with senior political figures, among them The Nixon Interviews with former United States President Richard Nixon in 1977. In these interviews Frost used his intelligent preparation and disarming yet fearless approach to elicit revealing responses from Nixon, including an admission that he "let the American people down" in the Watergate scandal. The interviews were later adapted into a stage play and film, entitled Frost/Nixon. Frost died on August 31 2013, aged 74, on board the cruise ship MS Queen Elizabeth, on which he had been engaged as a speaker. Tributes from politicians and media professionals alike testified to the enormous impact Frost had on television, in comedy and serious journalism. David Paradine Frost was born on April 7, 1939,in Tenterden, Kent, the son of a Methodist minister of Huguenot descent, the Rev. Wilfred John "W. J." Paradine Frost, and his wife, Mona (Aldrich); he had two elder sisters. Frost attended Barnsole Road Primary School in Gillingham, then Gillingham Grammar School and finally – while residing in Raunds – Wellingborough Grammar School. Throughout his school years he was an avid football and cricket player, and was offered a contract with Nottingham Forest F.C. For two years before going to university he was a lay preacher following his witnessing of an event presided over by the Christian evangelist Billy Graham. According to some accounts, Frost was the victim of snobbery from the group with which he associated at Cambridge. According to the satirist John Wells, the Old-Etonian actor Jonathan Cecil congratulated Frost for "that wonderfully silly voice" he used while performing, but then discovered that it was Frost's real voice. Christopher Booker, while asserting that Frost's one defining characteristic was ambition, commented that he was impossible to dislike. After leaving university, Frost became a trainee at Associated-Rediffusion. Meanwhile, having already gained an agent, Frost performed in cabaret at the Blue Angel nightclub in Berkeley Square, London during the evenings. Frost was known for relationships with several high profile women. In the mid-1960s, he dated British actress Janette Scott, between her marriages to songwriter Jackie Rae and singer Mel Tormé; in the early 1970s he was engaged to American actress and singer Diahann Carroll; between 1972 and 1977 he had a relationship with British socialite Caroline Cushing; in 1981 he married Lynne Frederick, widow of Peter Sellers, but they divorced the following year. He also had an 18-year intermittent affair with American actress Carol Lynley. On March 19, 1983, Frost married Lady Carina Fitzalan-Howard, daughter of the 17th Duke of Norfolk. Over the next five years, they had three sons, Miles, Wilfred, and George, and for many years lived in Chelsea, with their weekend home at Michelmersh Court in Hampshire. On August 31, 2013, Frost had a heart attack and died while aboard the Cunard Line cruise ship, MS Queen Elizabeth, on which he had been engaged as a speaker. Cunard said that the vessel had left Southampton for a ten-day cruise in the Mediterranean ending in Rome. His funeral was held at the Holy Trinity Church in Nuffield, Oxfordshire, attended by family and close friends, with a public memorial service held later. Frost's career in television broadcasting spanned 50 years and made him a household name in Great Britain, as well as internationally famous. During his career he interviewed a record eight British prime ministers and seven serving US presidents. His most well-known interviews were with former US President Richard Nixon. He also interviewed celebrities and political figures from around the world, including Prince Charles, Muhammad Ali, The Beatles, Mick Jagger, Orson Welles, Tennessee Williams, Noel Coward, the Shah of Iran, Golda Meir, Moshe Dayan, Yitzhak Rabin, and many others. Frost's career in television began when he was chosen by writer and producer Ned Sherrin to host the satirical program That Was the Week That Was, alias TW3 after Frost's flat mate John Bird suggested Sherrin should see his act at The Blue Angel. The series, which ran for less than 18 months during 1962-1963, was part of the satire boom in early 1960s Britain and became a popular program. The involvement of Frost in TW3 led to an intensification of the rivalry with Peter Cook who accused him of stealing material and dubbed Frost "the bubonic plagiarist." The new satirical magazine Private Eye also mocked him at this time. Frost visited the United States during the break between the two series of TW3 in the summer of 1963 and stayed with the producer of the New York production of Beyond The Fringe. Frost was unable to swim, but still jumped into the pool and his house, nearly drowning until he was saved by Peter Cook. At the memorial service for Cook in 1995, Alan Bennett recalled that rescuing Frost was the one regret Cook frequently expressed. For the first three editions of the second series of TW3 in 1963, the BBC attempted to limit the team by scheduling repeats of The Third Man television series after the program, thus preventing overruns. Frost took to reading synopses of the episodes at the end of the program as a means of sabotage. After the BBC's Director General Hugh Greene instructed that the repeats should be abandoned, TW3 returned to being open-ended. More somberly, on November 23, 1963, a tribute to the assassinated President John F. Kennedy formed an entire edition of That Was the Week That Was. An American version of TW3 ran after the original British series had ended. Following a pilot episode on November 10, 1963, the 30-minute US series, also featuring Frost, ran on NBC from January 10, 1964 to May 1965. Frost fronted various programs following the success of TW3, including its immediate successor, Not So Much a Programme, More a Way of Life, which he co-chaired with Willie Rushton and poet P. J. Kavanagh. Screened on three evenings each week, this series was dropped after a sketch was found to be offensive to Catholics and another to the British royal family. More successful was The Frost Report, broadcast between 1966 and 1967. The show launched the television careers of John Cleese, Ronnie Barker, and Ronnie Corbett, who appeared together in the Class sketch. Frost signed for Rediffusion, the ITV weekday contractor in London, to produce a "heavier" interview-based show called The Frost Programme. Guests included Sir Oswald Mosley and Rhodesian premier Ian Smith. His memorable dressing-down of insurance fraudster Emil Savundra, regarded as the first example of "trial by television" in the UK, led to concern from ITV executives that it might affect Savundra's right to a fair trial. Frost's introductory words for his television programs during this period, "Hello, good evening and welcome," became his catchphrase and were often mimicked. Frost was a member of a successful consortium, including former executives from the BBC, which bid for an ITV franchise in 1967. This became London Weekend Television, which began broadcasting in July 1968. The station began with a programming policy which was considered 'highbrow' and suffered launch problems with low audience ratings and financial problems. A September 1968 meeting of the Network Programme Committee, which made decisions about the channel's scheduling, was particularly fraught, with Lew Grade expressing hatred of Frost in his presence. He was involved in the station's early years as a presenter. On July 20 and 21, 1969, during the British television Apollo 11 coverage, he presented David Frost's Moon Party for LWT, a ten-hour discussion and entertainment marathon from LWT's Wembley Studios, on the night Neil Armstrong walked on the moon. Two of his guests on this program were British historian A.J.P. Taylor and entertainer Sammy Davis, Jr. In the same period he began an intermittent involvement in the film industry. Setting up David Paradine Ltd, he part-financed The Rise and Rise of Michael Rimmer (1970), in which the lead character was based partly on Frost, and gained an executive producer credit. In 1968 he signed a contract worth £125,000 to appear on American television in his own show on three evenings each week, the largest such arrangement for a British television personality at the time. From 1969 to 1972, Frost kept his London shows and fronted The David Frost Show on the Group W (U.S. Westinghouse Corporation) television stations in the United States. His 1970 TV special, Frost on America, featured guests such as Jack Benny and Tennessee Williams. Following the 1979 Iranian Revolution Frost was the last person to interview Mohammad Reza Pahlavi, the deposed Shah of Iran. The interview took place in Panama in January 1980, and was broadcast by ABC in the United States. Frost was an organizer of the Music for UNICEF Concert at the United Nations General Assembly in 1979. Ten years later, he was hired as the anchor of the new American tabloid news program Inside Edition.. He was dismissed after only three weeks, and then-ABC News reporter Bill O'Reilly was recruited as his replacement. The highlight of Frost's career in the United States was "The Nixon Interviews," a series of interviews with former US President Richard Nixon, which were recorded and broadcast in 1977. The interviews became the subject of the play Frost/Nixon, which was later made into a film of the same name; both starred Michael Sheen as Frost and Frank Langella as Nixon. After his resignation in 1974, Nixon had pent more than two years away from public life. In 1977, Nixon was publishing his memoirs and his publicist, Irving "Swifty" Lazar, believed that by using television Nixon could reach a mass audience and so he granted Frost an exclusive series of interviews. Frost agreed to pay Nixon for the interviews. However, the American news networks were not interested, regarding them as checkbook journalism, and refused to distribute the program. Frost was forced to fund the project himself while seeking other investors, who eventually bought air time and syndicated the four programs. Frost recruited James Reston, Jr. and ABC News producer Bob Zelnick to evaluate the Watergate minutiae prior to the interview. Their research allowed Frost to take control of the interview at a key moment, when he revealed details of a previously unknown conversation between Nixon and Charles Colson. Nixon's resulting admissions would support the widespread conclusion that Nixon had obstructed justice. Nixon continued to deny the allegation until his death, and it was never tested in a court of law because his successor, President Gerald Ford, issued a pardon to Nixon after his resignation. Nixon's staff saw the interview as an opportunity for the disgraced president to restore his reputation with the public, and assumed that Frost would be easily outwitted. Previously, in 1968, Frost had interviewed Nixon in a manner described by Time magazine as "so softly that in 1970 President Richard Nixon ferried Frost and Mum to the White House, where the Englishman was appointed to produce a show in celebration of the American Christmas." Frost taped almost 29 hours of interviews with Nixon over a period of four weeks. They were edited into 90 minute programs and broadcast in the US and other countries. The interviews were broadcast in four parts, with a fifth part containing material edited from the earlier parts broadcast several months later. The premiere episode drew 45 million viewers. The interviews were surprisingly revealing. Nixon, who had previously avoided discussing his role in the Watergate scandal which had led to his resignation as President in 1974, expressed contrition saying "I let the American people down and I have to carry that burden with me for the rest of my life". In Part 3, Frost asked Nixon about the legality of the president's actions. Nixon replied: "Well, when the president does it, that means that it is not illegal." Part 5 opened with Frost's blunt question, "Why didn't you burn the tapes?" A Gallup poll conducted after the interviews aired showed that 69 percent of the public thought that Nixon was still trying to cover up, 72 percent still thought he was guilty of obstruction of justice, and 75 percent thought he deserved no further role in public life. During his career as a broadcaster Frost was one of the supersonic passenger airliner Concorde's most frequent fliers, having flown between London and New York an average of 20 times per year for 20 years. Returning to British television in the 1980s, Frost was one of the "Famous Five" who launched TV-am in February 1983 but, like LWT in the late 1960s, the station began with an unsustainable "highbrow" approach. Frost remained a presenter after restructuring. Frost on Sunday began in September 1983 and continued until the station lost its franchise at the end of 1992. Frost had been part of an unsuccessful consortium, CPV-TV, with Richard Branson and other interests, which had attempted to acquire three ITV contractor franchises prior to the changes made by the Independent Television Commission in 1991. After transferring from ITV, his Sunday morning interview programme Breakfast with Frost ran on the BBC from January 1993 until May 29, 2005. Frost hosted Through the Keyhole, which ran on several UK channels from 1987 until 2008 and also featured Loyd Grossman. Produced by his own production company, the program was first shown in prime time and on daytime television in its later years. In the twenty-first century, Frost worked for Al Jazeera English, presenting a live weekly hour-long current affairs program, Frost Over The World, which started when the network launched in November 2006. The program regularly made headlines with interviewees such as Tony Blair, President Omar al-Bashir of Sudan, Benazir Bhutto, and President Daniel Ortega of Nicaragua. The program was produced by the former Question Time editor and Independent on Sunday journalist Charlie Courtauld. Frost was one of the first to interview the man who authored the Fatwa on Terrorism, Muhammad Tahir-ul-Qadri. In 2007, Frost hosted a discussion with Libya's leader Muammar Gaddafi as part of the Monitor Group's involvement in the country. In June 2010, Frost presented Frost on Satire, an hour-long BBC Four documentary looking at the history of television satire. Prominent satirists who were interviewed for the program include Rory Bremner, Ian Hislop, John Lloyd, Chevy Chase, Bill Maher, Jon Stewart, Will Ferrell, and Tina Fey. In February 2009, Frost was featured on the Australian Broadcasting Corporation's international affairs program Foreign Correspondent in a report titled "The World According To Frost," reflecting on his long career and portrayal in the film Frost/Nixon. 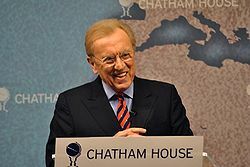 In 2011, Frost spoke at the Chatham House, home of the Royal Institute of International Affairs, on his experiences interviewing famous world figures. Frost was a patron and former vice-president of the Motor Neurone Disease Association charity, as well as being a patron of the Alzheimer's Research Trust, the Elton John AIDS Foundation, the Hearing Trust, East Anglia's Children's Hospices, and the Home Farm Trust. Frost's career in broadcasting left an indelible mark, entertaining and educating the public regarding current affairs for 50 years. According to Kitty Muggeridge in 1967, he had "risen without a trace" from the world of satirical comedy to become the world's most celebrated interviewer. Frost was the only person to have interviewed all eight British prime ministers serving between 1964 and 2010 (Harold Wilson, Edward Heath, James Callaghan, Margaret Thatcher, John Major, Tony Blair, Gordon Brown, and David Cameron) and all seven US presidents in office between 1969 and 2008 (Richard Nixon, Gerald Ford, Jimmy Carter, Ronald Reagan, George H. W. Bush, Bill Clinton, and George W. Bush). On hearing of Frost's death, British Prime Minister David Cameron paid tribute, saying: "He could be—and certainly was with me—both a friend and a fearsome interviewer." Michael Grade commented: "He was kind of a television renaissance man. He could put his hand to anything. He could turn over Richard Nixon or he could win the comedy prize at the Montreux Golden Rose festival." 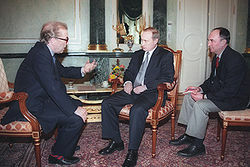 Frost's received international recognition for his interviews of former President Richard Nixon, and the admissions he extracted. The interviews were used as the basis for the play, Frost/Nixon, written by Peter Morgan. It was presented as a stage production in London in 2006, and on Broadway in 2007. The play was then adapted into a Hollywood motion picture starring Michael Sheen as Frost and Frank Langella as Nixon, both reprising their stage roles. The film was directed by Ron Howard and released in 2008. It was nominated for five Golden Globe awards: Best Motion Picture Drama, Best Director, Best Actor, Best Screenplay and Best Original Score, and for five Academy Awards: Best Picture, Best Actor, Best Director, Best Adapted Screenplay, and Best Editing. ↑ 1.0 1.1 1.2 1.3 1.4 Stuart Jeffries, Sir David Frost obituary, The Guardian, September 1, 2013. Retrieved September 6, 2013. ↑ 2.0 2.1 2.2 2.3 2.4 Maren Robinson, Frost/Nixon Study Guide TimeLine Theatre Company, 2010. Retrieved September 6, 2013. ↑ Adrian Higgins, Frost, famous for Nixon interview, dies The Journal Gazette, September 2, 2013. Retrieved September 6, 2013. 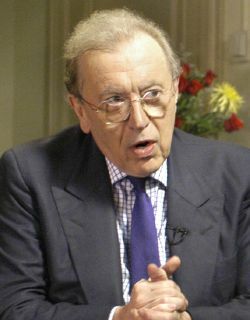 ↑ Oliver Duff, My Life in Media: Sir David Frost The Independent, May 2, 2005. Retrieved September 6, 2013. ↑ 5.0 5.1 Obituary: Sir David Frost, The Telegraph, September 1, 2013. Retrieved September 6, 2013. ↑ 6.0 6.1 6.2 Humphrey Carpenter, That Was Satire That Was: The Satire Boom of the 1960s (London: Victor Gollancz, 2001, ISBN 978-0575065888), 207. ↑ W. Lee Cozad, More Magnificent Mountain Movies: The Silverscreen Years, 1940-2004 (Sunstroke Media, 2006, ISBN 978-0972337229), 219. ↑ David Frost: tributes to TV's 'most illustrious inquisitor' The Week, September 2, 2013. Retrieved September 6, 2013. ↑ Jon Stock, For sale: the stunning Hampshire home of Sir David Frost The Daily Telegraph, March 1, 2013. Retrieved September 6, 2013. ↑ 11.0 11.1 Sir David Frost, broadcaster and writer, dies at 74 BBC News, September 1, 2013. Retrieved September 5, 2013. ↑ Claire Carter, Sir David Frost dies of heart attack The Telegraph, September 1, 2013. Retrieved September 5, 2013. ↑ Cruise company pays tribute to Sir David Frost ITV News, September 1, 2013. Retrieved September 5, 2013. ↑ Sir David Frost funeral: Stars join family for private ceremony BBC News, September 12, 2013. Retrieved September 13, 2013. ↑ 15.0 15.1 Sir David Frost's Greatest TV Moments Sky News, September 1, 2013. Retrieved September 13, 2013. ↑ Sir David Frost - a profile BBC News. Retrieved September 16, 2013. ↑ Simon Hattenstone, "The Saturday interview: David Frost", The Guardian, July 2, 2011. Retrieved September 10, 2013. ↑ 20.0 20.1 20.2 20.3 Michael Leapman, "Sir David Frost: Pioneering journalist and broadcaster whose fame often equalled that of his interviewees", The Independent, September 1, 2013. Retrieved September 10, 2013. ↑ David Frost, An Autobiography: Part One From Congregation to Audiences (London: HarperCollins, 1993), 382. ↑ "British TV History: The ITV Story: Part 10: The New Franchises", Teletronic. Retrieved September 10, 2013. ↑ ITV Moon Landing Coverage British TV History. Retrieved September 10, 2013. ↑ Rita Zajacz, Frost David: British Broadcast Journalist/Producer The Museum of Broadcast Communications. Retrieved September 10, 2013. ↑ 26.0 26.1 26.2 Transcript of CNN's Larry King Live: Frost, Schieffer, Bradlee Discuss Extensive Nixon Interview CNN, June 10, 2002. Retrieved September 13, 2013. ↑ James Reston Jr. On The 'Frost/Nixon' Interviews NPR, December 10, 2008. Retrieved September 13, 2013. ↑ Theodore H. White, Breach of Faith: The Fall of Richard Nixon (Scribner, 1975, ISBN 978-0689106583). ↑ David Can Be a Goliath TIME Magazine, May 9, 1977. Retrieved September 16, 2013. ↑ Profile: Sir David Frost BBC News, November 24, 2009. Retrieved September 16, 2013. ↑ David Frost, Who Interviewed Nixon, Is Dead at 74 The New York Times, September 1, 2013. Retrieved September 16, 2013. ↑ Nixon's Views on Presidential Power: Excerpts from an Interview with David Frost Landmark Cases, From the third Nixon-Frost interview, The New York Times, May 20, 1977, A16. Retrieved September 16, 2013. ↑ Ken Hughes, Why Didn't Nixon Burn the Tapes? Presidential Recordings Program, University of Virginia. Retrieved September 16, 2013. ↑ Christopher Orlebar, The Concorde story (Osprey Publishing, 2004, ISBN 978-1855326675), 181. ↑ Al Jazeera, Frost over the World - Fatwa on Terrorism Al Jazeera English, Interview with David Frost, March 2, 2010. Retrieved September 15, 2013. ↑ Peter Overby, U.S. Firm Under Fire For Gadhafi Makeover Contract NPR, March 10, 2011. Retrieved September 15, 2013. ↑ Mark Corcoran, The World According to Frost ABC News, February 17, 2009. Retrieved September 15, 2013. ↑ Interviews I Shall Never Forget Chatham House, October 13, 2011. Retrieved September 15, 2013. ↑ Patrons Alzheimer's Research UK. Retrieved September 15, 2013. ↑ Our patrons Elton John AIDS Foundation. Retrieved September 15, 2013. ↑ CaritasData, Who's Who in Charities (CaritasData Ltd, 2006, ISBN 978-1904964278). ↑ "Broadcaster Frost rose from satire to friendly interviewer", The Standard (Hong Kong), September 2, 2013. Retrieved September 10, 2013. ↑ Al Jazeera host David Frost dies Al Jazeera, September 2, 2013. Retrieved September 5, 2013. ↑ Peter Walker, David Frost dies aged 74 The Guardian, September 1, 2013. Retrieved September 5, 2013. ↑ The London Gazette (Supplement) No. 45117 p. 6373-6374 June 13, 1970. Retrieved September 5, 2013. ↑ The London Gazette No. 53284. p. 7209. April 23, 1993. Retrieved September 5, 2013. ↑ 47.0 47.1 47.2 47.3 David Frost Speaker Profile Global Speakers Bureau. Retrieved September 5, 2013. In pictures: Frost's 50-year career BBC. This page was last modified on 10 November 2017, at 22:57.